Is This Why Readers Don’t Finish Books? If you believe a 2013 Goodreads blog post, only one in four readers say they will stick with a book to the end, no matter what. What’s going on? Why do readers invest time in a book only to abandon it before reaching the end? And what does that mean for indie authors? Since I began interviewing traditionally-published authors some thirty years ago, and indie authors about three years ago, I have read — or, more precisely, started — literally thousands of books. 1. It just got boring. It’s not that I need a heart-stopping action scene on every page, but I do need some forward movement. Flashbacks are fine, as long as they help move the overall story along, but come on, let’s face it, many books just stall. 2. It’s a mystery, and I’ve already figured it out. I skipped to the end and I was right. I once started reading a book by a very, very well-known traditionally-published mystery writer. After reading the first chapter, for reasons I don’t now recall I skipped to the final few pages. And the ending made perfect sense. But it shouldn’t have, because I realized that meant the author had introduced no meaningful red herrings, false leads, or even useful secondary characters. I literally had no reason to read the entire middle of the book — and I didn’t. 3. The plot took a bizarre turn and now it’s a different kind of book than I thought it was. When this device works it’s spectacular. But when it doesn’t, it’s disastrous. A war story that turns into a romance. A mystery that becomes an alien-invasion thriller. Each can work, if done well, but if the reader hates romances, or aliens, that’s time to close that book and move on. 4. There are too many spelling, grammar, and punctuation errors. 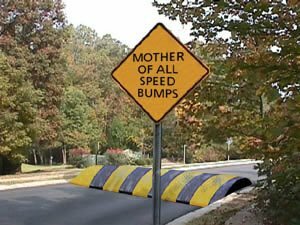 Spelling, punctuation and grammar errors are like a speed bump. Every single one of those is a speed bump. If an author guides me skillfully up to highway speed — metaphorically — then I turn the page and see a glaring goof, it has the same effect as hitting a speed bump at 65 miles an hour. It’s jarring and distracting, and makes me slow down. And if there are more such speed bumps, it’s time to get off that road. 5. I just didn’t care what happened to these characters. Maybe even worse than hard-to-believe characters are those you don’t care about. Of course not every character is going to have a memorable role in a book, but the protagonist(s) and antagonist(s) must be people we care about, or else why are being told the story in the first place? 6. 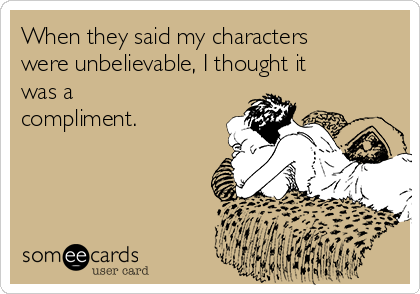 I could no longer find the characters believable. They call reading fiction a “suspension of disbelief” for a reason. You have to temporarily forget that you’re being engaged by people who don’t exist. The illusion is shattered once the author’s carelessness or ineptitude reminds you that the characters you’ve come to think of as real are, in fact, just cardboard. It’s hard, if not impossible, to get that illusion back once it’s broken. It’s easier for the reader to just cut her losses and move on. 7. I put the book down, intending to come back to it, but after a few days realized I didn’t miss it while I was gone. Really left an impression, huh? So good, I couldn’t even remember the main character’s name? I used to have a whole stack of this kind of book — nice to start reading, but not compelling enough to come back and finish. I love chocolate cake, but not enough to live on a diet of fourteen-layer double fudge explosions. Some books are simply exhausting — and many could use some serious editing, as in the kind of editing that cuts the book by a third or more. 9. I’ve read it before. This happens to me more often with movies than books, but I’ve actually picked up a book and realized I’d already read it. Or one exactly like it that someone else did better. wrote better. 10. A better book came along. 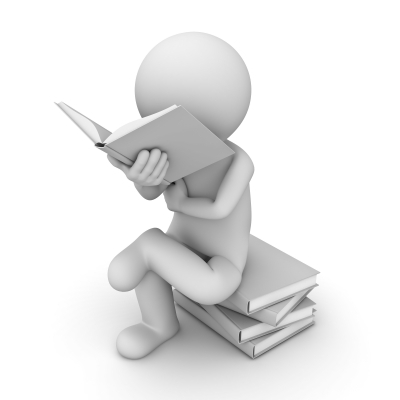 Many people read two or three books at once, shuttling back and forth between titles. If you’re halfway through a mediocre book when you start a new one that’s really good, there’s an excellent chance you won’t go back to the first one. I’m sure there are many more reasons for not finishing a book (please add yours in the comments section). But what is the takeaway for indie authors? They already know it. Write fast-moving, well-edited books with three-dimensional, memorable characters. Piece of cake. 8 Responses to Is This Why Readers Don’t Finish Books? I’d add one more — it was poorly written. Since I got my Kindle, I’ve increased the number of impulsive book buys. This sometimes means I’ll get captured by a premise, title or setting, only discover that the writing is substandard. This doesn’t mean inadequate proof reading, I’m referring to the fundamental storytelling. When that disappoints there is no reason to keep turning the electronic pages. That’s what I love about the sampling option on Amazon – you can try the first 10% of the book for free, and if it doesn’t capture your interest, you don’t have to buy or finish. In the last six months I’ve finished one Indie book. I’m a lot more likely to finish a trad-published book because they tend to be better – at least, better-edited. It seems that trad-published books aren’t rushed into publication before they’re actually finished. I know a few indie authors who write a rough draft, polish it once, submit it for light copy-editing, and upload it to Amazon. I download my sample and think, “this would have been better if it had undergone revisions and had sat for a while.” It appears that indie authors are overeager to publish and make money, which hurts them in the long run. Numbers 4 and 7 are the biggest reasons why I don’t finish books, followed by no. 1. 11. I feel the author is preaching or lecturing to me. 12. The author is just so self-absorbed, it’s obnoxious. There certainly seems to be a common message for all authors, indie or not, in these comments: don’t send that book out into the world until it is as perfect as it can be. Candy, you make an excellent point. Poor storytelling, even if the grammar and punctuation are intact, will lose me every time. Terra, you’re right, many indie authors seem to skimp on the professional editing (although, to be fair, in recent years a lot of Big Five books also seem to be frustratingly editor-free). Editors can be expensive, and I sense that many indies want or need to save money – to their ultimate detriment. Even traditionally published books can and do have many errors not just grammar but there are POV shifting, telling and info dumping, long and boring paragraphs that make up for pages and pages of exposition. Not every editor is worth their salt and I’ve been sent books by self published authors who unfortunately paid big $$ to have their books edited. I know it’s not editor’s job to rewrite your book, but at least point out hey, can you show this instead of telling. But if the author isn’t familiar with the concept that no editor will help. Taking a few writing workshops is very important. Many just wake up one day and decide to write a book, but there’s so much more to it. Agree. A generation ago, you had editors like the great Michael Korda who would work with authors – even the biggest names – to improve their books. These days, good luck with that. I will explore in a future blog post the question: are books, generally, just too long? For me it’s a gross factor. Many erotica books (especially written by novice authors) turns into full gyno exam complete with stir-ups. I stopped reading 50 Shades at the tampon scene. Yuck! There are some things that just should not make it into a book, no matter how many people got turned on on it. Zrinka, I’m reminded of something actor Carl Reiner once remarked on. He said in the movies, it always made him uncomfortable when the director “showed too much.” He said he would virtually yell at the screen, “Cut away! Cut away!” Yes, authors, often less IS more.